If the odds are still stacked against success for women artists, think what they must have been like in the early twentieth century. It took a very special kind of woman to succeed in painting then, someone with the strong character of Louise Upton Brumback (1867-1929). 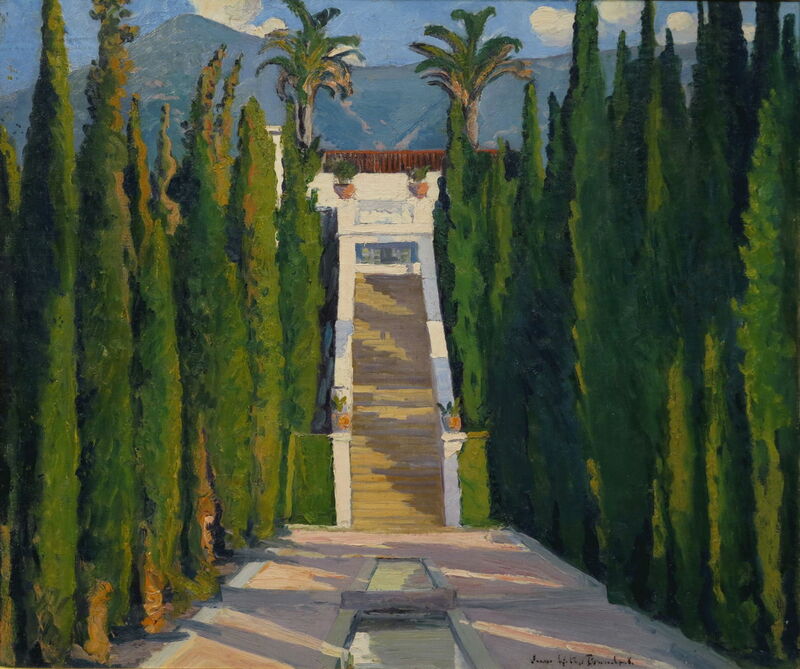 Louise Upton, as she was before she married, chose to paint because of her great uncle, William Page, who had been President of the National Academy of Design when she was a young girl. However, her father, a banker, incurred huge losses when speculating in oil, and in late 1882 he embezzled large amounts of money from the bank which he owned to try to cover those losses. His bank collapsed as a result, and the following year he was convicted of embezzlement, dying in 1886 while his appeal was still pending. In 1889, her mother, Louise, and her twin sister moved from New York to Kansas City, Missouri, and in 1891 Louise married a leading attorney and author there. 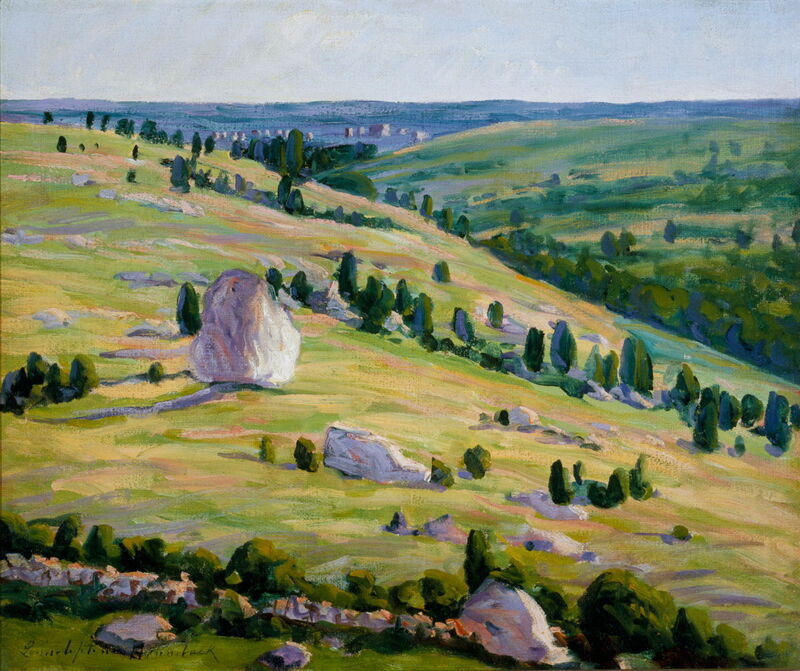 It wasn’t until about 1900 that she started any formal training in painting, first at one of William Merritt Chase’s summer schools for plein air painting in the Shinnecock Hills of Long Island. Her attitude to formal instruction was typically forthright, as she later explained. She believed that it helped her learn good technique, but that you cannot be taught individual style or skills of self-expression. Nevertheless she progressed to Chase’s New York School of Art for a while, and the Pennsylvania Academy of the Fine Arts, before pursuing her career as a painter. In this she was wholeheartedly supported by her husband, and his comfortable income. She first exhibited in 1902, in Kansas City, Missouri, and in 1905 at the National Academy of Design in New York. From 1909, the Brumbacks spent their summers in the artists’ colony of Gloucester, Massachusetts, and the rest of the year in Manhattan; those summers were to prove her most productive seasons. Louise Upton Brumback (1867-1929), Bathers Along the Shore (1910), oil on panel, 25.4 x 35.6 cm, Private collection. Wikimedia Commons. From the outset, Brumback’s paintings reflected her nature. 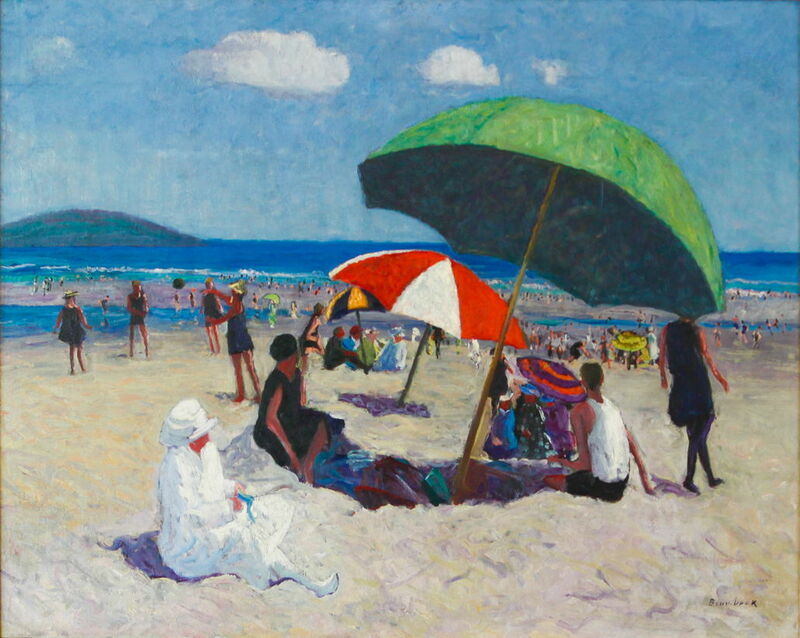 Bathers Along the Shore (1910) is decidedly post-Impressionist, highly individual, colourful, and expressed in strong terms. 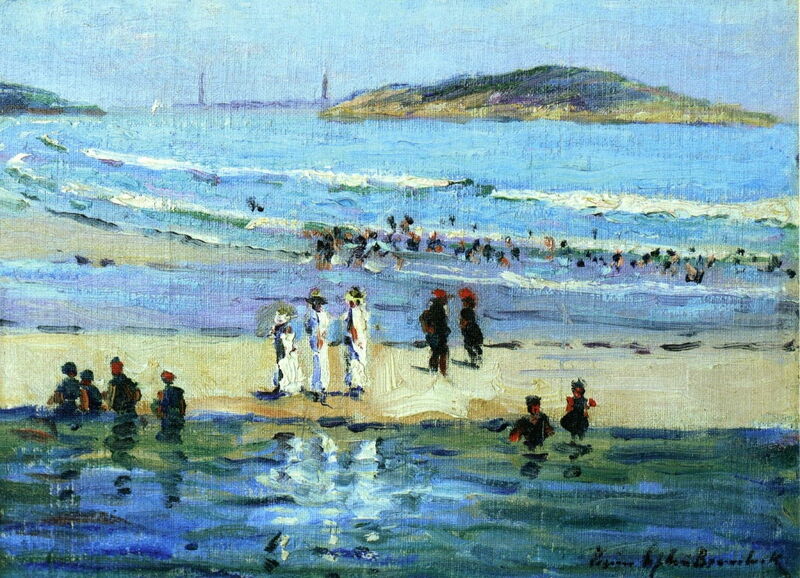 Louise Upton Brumback (1867-1929), Gloucester, Massachusetts (1912), oil on canvas, 60.3 x 72.4 cm, Private collection. Wikimedia Commons. 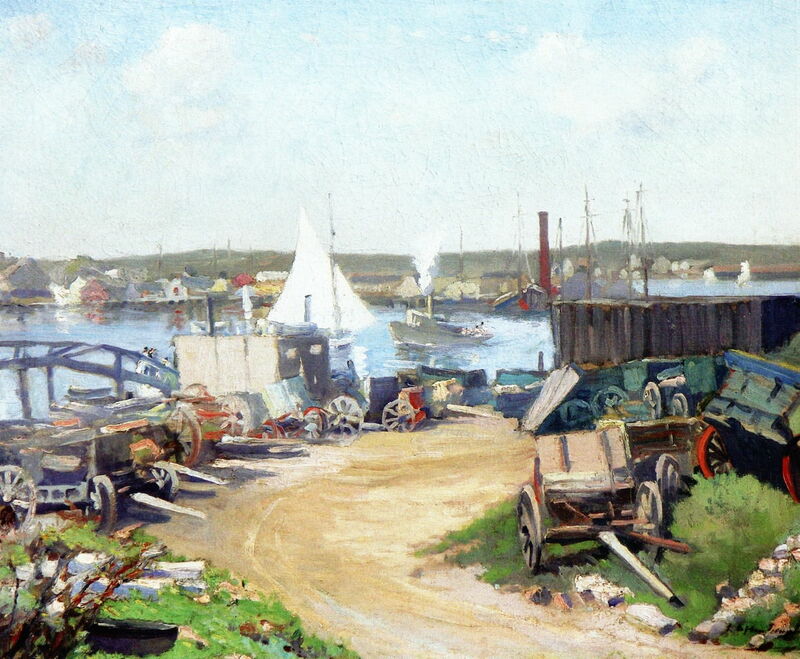 Gloucester, Massachusetts (1912) is an unusual view of part of what had been one of the USA’s busiest seaports. In 1912 the Brumbacks had a house built for them in East Gloucester, and Louise started to exhibit more frequently, and much more successfully. By 1914, she showed paintings at the National Academy of Design, the Art Institute of Chicago, the Corcoran Gallery in Washington DC and in Boston, and had a solo show at the Fine Arts Institute in Kansas City. Her husband was able to retire from legal practice, and then devoted his time and effort to supporting Louise’s career. 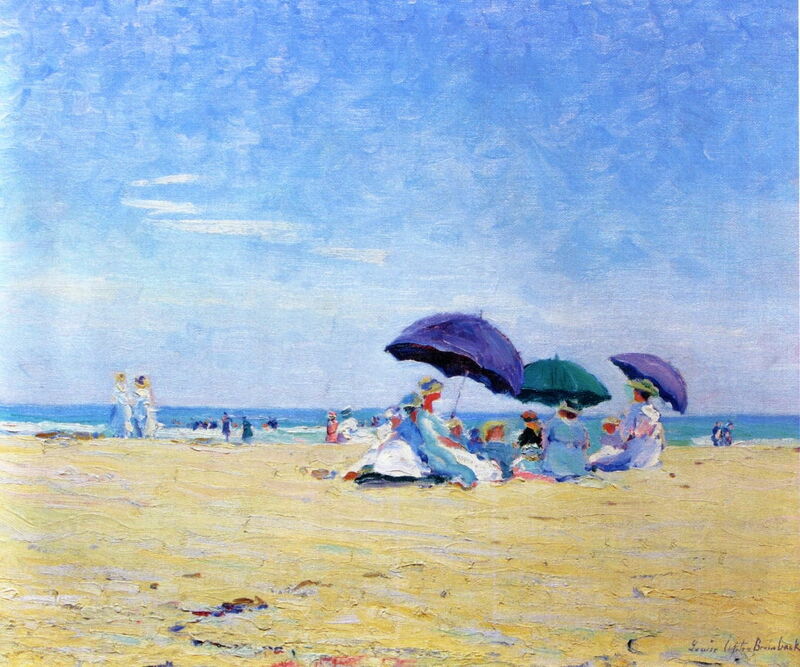 With her more mature style, she became best-known for vibrantly colourful beach scenes, such as her Good Harbor Beach (1915), showing the coast near Gloucester, Massachusetts. Louise Upton Brumback (1867-1929), Good Harbor Gloucester (date not known), oil on canvas, 59.7 x 70 cm, Private collection. The Athenaeum. 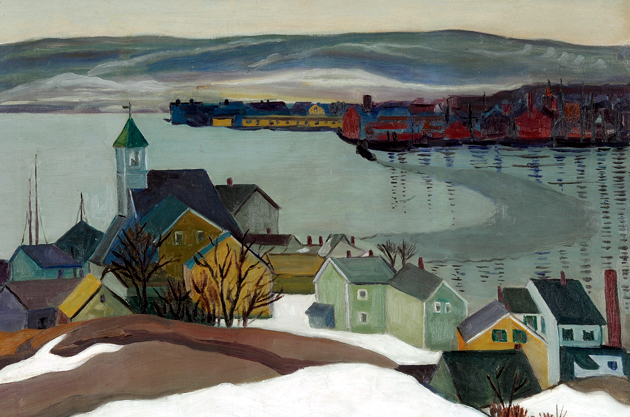 Good Harbor Gloucester (date not known) was probably painted in the same, or an adjacent, summer. Louise Upton Brumback (1867-1929), Three Umbrellas (date not known), oil on canvas, 63.5 x 76.2 cm, Private collection. The Athenaeum. 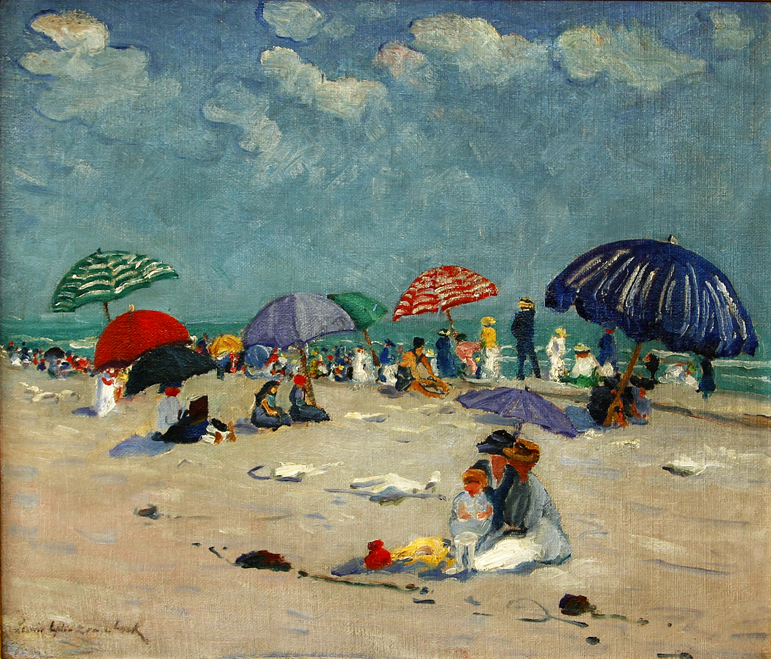 Three Umbrellas (date not known) features impasto across the beach, and unusual brushstrokes in the sky. 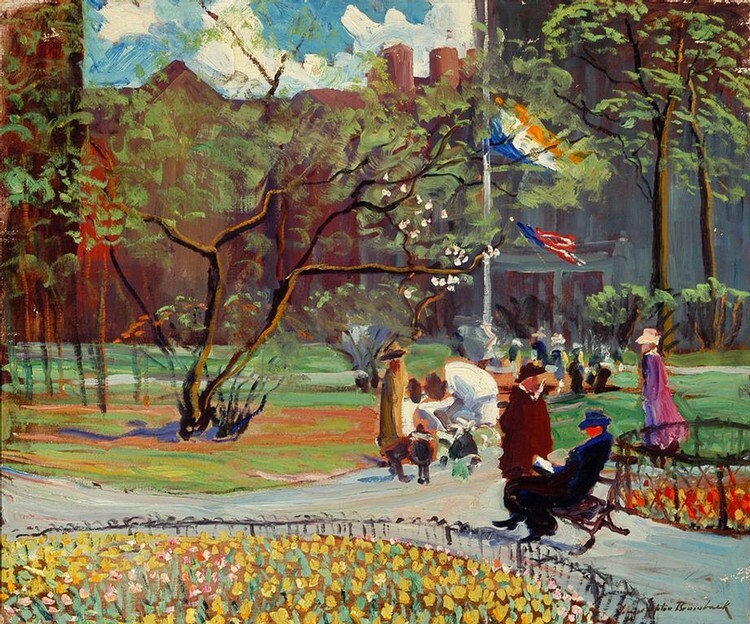 I particularly like her rich colour contrasts and vigorously-brushed foliage in May Day, Boston (1918), one of only three paintings of hers which I have been able to trace, which were not painted in or near Gloucester. 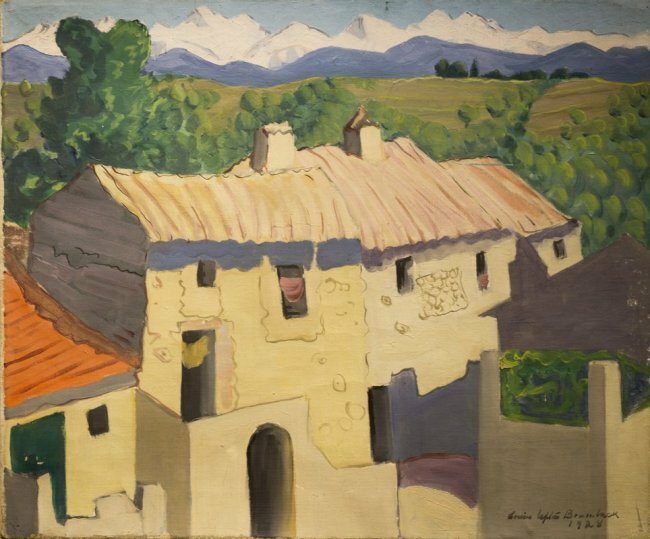 By 1918, she was rated as one of the best women painters of the day, and frequently attracted critical acclaim. She started travelling to California, where she painted Pacific coastal scenes in particular. Louise Upton Brumback (1867-1929), Garden in San Simeon, California (date not known), oil on canvas, 63.5 x 76.2 cm, Private collection. Wikimedia Commons. Garden in San Simeon, California (date not known) is the only painting of hers I have discovered from those campaigns on the West Coast. In addition to its formal symmetry, its brushwork is more ‘finished’. Louise Upton Brumback (1867-1929), Dogtown, Cape Ann, Massachusetts (1920), oil on canvas, 63.5 x 76.2 cm, Private collection. Wikimedia Commons. 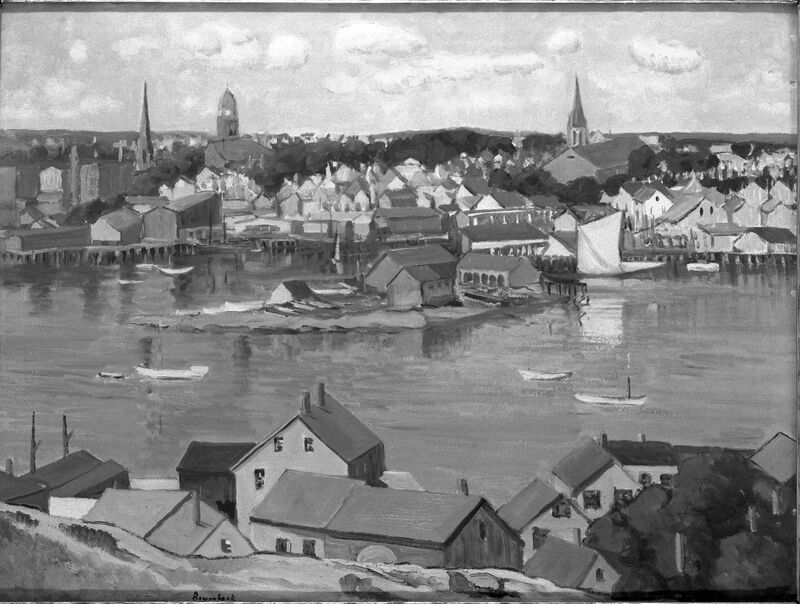 Dogtown, Cape Ann, Massachusetts (1920) shows this historic area between Gloucester and Rockport, which was an active settlement between 1693 and 1830. Rocky and with poor soil, it now consists of woodland with a mesh of trails and old roads, which are seen in the valley on the right. Louise Upton Brumback (1867-1929), Grey Day Gloucester (1920), oil, dimensions not known, Private collection. Wikimedia Commons. Even some of her later paintings have a primitive look about them, as in Grey Day Gloucester (1920), with its boxy houses, relaxed perspective, and simple reflections. Louise Upton Brumback (1867-1929), Gloucester Harbour (c 1921), oil on canvas, 76.3 x 102 cm, The Brooklyn Museum, New York, NY (gift of Alfred Bossom). Courtesy of The Brooklyn Museum. Note the original painting is in full colour. Although I have only been able to obtain this monochrome image of her Gloucester Harbour (c 1921), its details show a marked contrast. In the 1920s, she became a well-known and forceful art activist, particularly for other women artists. She disliked jury systems, which she felt skewed public taste and were prejudiced against women artists, and in 1922 became President of the Gloucester Society of Artists, which exhibited without prior selection by jury. In 1925, she became a member of the New York Society of Women Artists, which also did not use jury selection, but allocated each of its limited membership the same amount of space for exhibition. Louise Upton Brumback (1867-1929), Afternoon Sun (1928), oil on canvas, 45.7 x 55.2 cm, Private collection. Wikimedia Commons. Afternoon Sun (1928) appears to show a landscape in California, with snow-covered mountains in the far distance. She died relatively young, at the age of only 62, in early 1929. Posted in General, Painting and tagged Brumback, Chase, Post-impressionism, Upton. Bookmark the permalink.